The 1997 Southeast Asian Games (Indonesian: Pesta Olahraga Asia Tenggara 1997), officially known as the 19th Southeast Asian Games (Indonesian: Pesta Olahraga Asia Tenggara ke-19) was a Southeast Asian multi-sport event held in Jakarta, Indonesia. This was the third time Indonesia hosted the games and its first time since 1987. Previously, Indonesia also hosted the games for the first time in 1979. Around 4696 athletes from 10 participating nations participated at the games, which featured 440 events in 34 sports. The games was held from 11 to 19 October 1997, although several events had commenced from 5 October 1997. The games was opened by Soeharto, the President of Indonesia at the Gelora Bung Karno Stadium, then known as Senayan Sports Stadium. The final medal tally was led by host Indonesia, followed by Thailand and Malaysia. Several Games and National Records were broken during the games. The games were deemed generally successful with the rising standard of competition amongst the Southeast Asian nations. 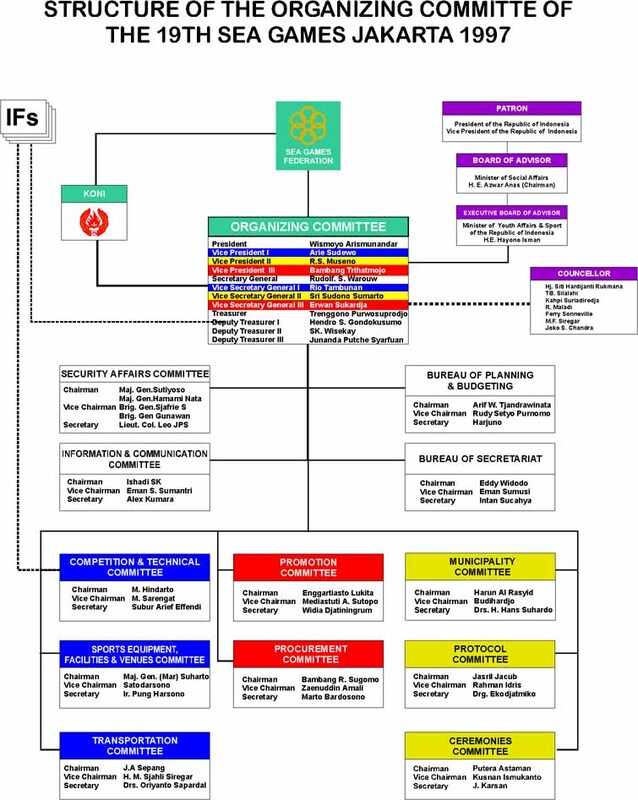 The Organising Committee Of The 19th SEA Games Jakarta 1997 (JASOC) led by President Wismoyo Arismunandar was formed to oversee the staging of the games. The 1997 Southeast Asian Games used a mix of new, existing and temporary venues. Some major retrofitting work were done in most venues, although they had been used to host major multi-disciplinary events such as the 1962 Asian Games, the 1979 Southeast Asian Games and the 1987 Southeast Asian Games. At the centrepiece of the activities was the Gelora Bung Karno Sports Complex, then Senayan Sports Complex which was completed on 24 July 1962. Incorporating the 120,800-seat national stadium at that time, it hosted most of the events. A games village was not built. Instead, a "village in the city" concept saw athletes and officials housed in were housed in hotels in Jakarta and West Java. Besides being physically near to the sport venues, it was hoped that it will add vibe to both provinces and reduce post-games costs in converting a dedicated games village to other uses. The 19th Southeast Asian Games had 35 venues for the games, 29 in Jakarta and 6 in West Java. Hanuman, the white monkey character in the Ramayana epic, the official mascot of the games. The logo of the 1997 Southeast Asian Games is an image of three flames, and two torch rings which represents the 5 basic foundations of The Republic of Indonesia, Pancasila. The upward flames represent the aspiration of the participating nations to achieve the highest standards at the 19th Southeast Asian Games in Jakarta. The colours of red, blue, and yellow are the basic colours of the flame. The red represents the "spirit" of the Games, the blue represents the "dynamism" of the Games and the yellow represents the "hope" the Games brings to the athletes and people of Southeast Asia. The six-ring chain, the logo of the Southeast Asian Games Federation represents the six founding nations of the Southeast Asian Games and the Southeast Asian Games itself. The gold colour of the Southeast Asian Games Federation Logo represents the quality and solidarity of the Games. The games' logo is the last logo in Southeast Asian Games history to use the 6-ring chain Federation logo before it was replaced by the 10-ring chain Federation logo at the 1999 Southeast Asian Games. The mascot of the 1997 Southeast Asian Games is a Ramayana epic character named "Hanuman". The Ramayana, known in Java, Indonesia as Kakawin Ramayana, is an Indian epic, which spread into Southeast Asia including the Indonesian archipelago during the ancient times. It does not only exists in oral and literary works, but also serves as the underlying theme for art performances and as the inspiration for other works, such as sculptures, paintings and literature. According to the Ramayana epic, he is an ardent devotee of Rama who fighting alongside him in the face of conflict and struggle and is always successful in accomplishing his tasks due to his superiority in speed, strength and altitude. The tasks managed by Hanuman in the epic includes: travel to Alengka (Lanka) and back in a day, fought in several battles and able to fly in the clouds when performing duties. Hanuman exist in the form of a white monkey in the Javanese adaptation of the epic and is one of the characters featured in the Wayang Shadow Puppet Show, known to the locals with the title Sang Kera Pemuja Dewa Rama (The mighty devotee ape of Rama). The adoption of Hanuman as the games mascot is to promote the games motto: "May the best man win", a phrase used before a competition to hope that the most deserving person wins. The cotton white colour of his body hair, a colour which symbolises sincerity and innocence, while the gold and black colour represents his attribute as a Wayang character. His cotton white colour represents sportsmanship spirit, while the yellow and black colour represents quality. A total of 31 sponsors sponsored the games. The opening ceremony was held at the Senayan Sports Stadium on 11 October 1997 at 19:00 (WIB). The closing ceremony was held at the Senayan Sports Stadium on 19 October 1997 at 19:00 (WIB). A total of 1421 medals, comprising 448 Gold medals, 432 Silver medals and 541 Bronze medals were awarded to athletes. The host Indonesia's performance was their best ever yet and emerged as overall champion of the games. ^ "Accomodation [sic] of the 19th SEA Games". Official Website. 1 December 1998. Archived from the original on 1 December 1998. Retrieved 9 February 2017. ^ "Venues for every Sports Event". Official Website. 2 December 1998. Archived from the original on 2 December 1998. Retrieved 9 February 2017. ^ "1997 Southeast Asian Games Official Website". 11 January 1998. Archived from the original on 11 January 1998. Retrieved 10 February 2017. ^ "The 19th SEA Games Stamp". ^ "Tokopedia: First day cover stamps of the games". ^ "The 19th SEA Games Phone Card". Wikimedia Commons has media related to 1997 Southeast Asian Games. "1997 Southeast Asian Games Official Website". 11 January 1998. Archived from the original on 11 January 1998. Retrieved 10 February 2017. This page was last edited on 26 October 2018, at 15:05 (UTC).